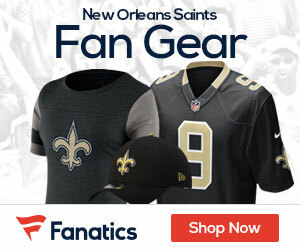 When the 2019 NFL Free Agency signing period first began 1 week ago last Monday, the New Orleans Saints already knew in advance that they were going to address some issues that required their immediate attention during this current Off-Season, particularly along the line of scrimmage on both of sides of the football "down in the trenches" — where games and sometimes even all-out warfare takes place each and every Sunday among the sport of Pro Football's most physically-dominating players. But now just one week later, the Saints up to this point have already signed a total of three Free Agent linemen and all of them no older than age 26; which should allow them the opportunity to keep both of their offensive and defensive lines relatively young as they head into the future after Drew Brees' eventual retirement that will be coming up soon within the next couple of seasons. Late last night, the Black and Gold added the latest such player to their roster, when it was announced the team had signed 26-year old former Minnesota Vikings center / guard Nick Easton to a new 4-year, $24 million contract; to essentially replace former starting center Max Unger — who had shocked everyone this past weekend when he announced his retirement with one year still remaining on his contract. The Saints organization wasted little time in finding a player they felt would be the best candidate to replace the 32-year old Unger, whom they originally had acquired a few years ago from the Seattle Seahawks in the Jimmy Graham trade and whom many considered to still be one of the better players at the center position throughout the entire League. Easton — a native of North Carolina who played his college ball at Harvard University in Boston — is a former undrafted free agent veteran who originally signed with the Baltimore Ravens following the conclusion of the 2015 NFL Draft. Easton played all 4 seasons at Harvard, and over the course of his 24 career starts earned recognition as a "small school" star performer by being chosen for 1st-team All-Ivy League, BSN All-American, 3rd-team FCS All-American and 1st-team FCS North All-American honors. But the Ravens quickly realized that they had a legitimate talent on their hands, as Easton wasted little time as a rookie establishing himself as one of the more underrated and overlooked O-Lineman of his draft class. Easton earned a reputation as one of Baltimore's most consistent players during the 2015 NFL Pre-Season, and the folks over at analytics website Pro Football Focus listed him as having the Ravens’ top overall grade (+9.1) among all offensive linemen. At that particular time, Easton's grade was also the highest of any center and 7th-best of any position player in the entire League. However despite his future potential, the Ravens decided to use Easton as trade bait to earn additional picks the following year in the 2016 NFL Draft; when he was sent to the San Francisco 49ers in exchange for a conditional 7th-round pick that year. But Easton's time in San Francisco only lasted a few short months, when 49ers team brass decided to trade Easton and a 2017 sixth-round pick to the Minnesota Vikings in exchange for linebacker Gerald Hodges. Once Easton finally got "settled in" with his new surroundings, he made an immediate impact for Minnesota; eventually making his first-ever NFL career start in place of starting Vikings center Joe Berger in Week #13 of that season against the Dallas Cowboys. Easton earned a 2nd straight start the following week, when Berger was unable to clear the concussion protocol. Then in his 3rd NFL season in 2017, Easton truly began to make his mark and begin to develop a reputation for his notable versatility; as he went on to earn the Vikings starting left guard spot and started in a total of 12 games before he suffered a fractured right ankle in Week #16. Then last season as Easton sought to pick up where he had left off in 2017, injuries once again derailed him during Vikings Training Camp in the late Summer; and he was placed on injured reserve after suffering a neck injury in mid-August that ended his season prematurely. His contract expired at the end of the year, and although Minnesota still was hoping to re-sign him, he wasn't considered one of their top priorities as they needed to re-sign other key veteran players this Off-Season. The Athletic.com Vikings beat writer / film analyst Arif Hassan says that at 6-foot-3, 300 pounds even, Easton is an athletic center who is very aggressive and will often seek out contact, and in general will often display "flashes" of top-level performance, particularly as a pass-blocker. However, Hassan cautions that Easton has struggled mightily at times as a run blocker; and even though he's capable of executing proper blocking technique at the second level (out in the open field), Easton's biggest issues with run-blocking stem from his inability to establish a low center of gravity and at times can be overpowered or tossed aside by bigger and stronger D-Linemen. That's something that Saints fans will want to keep an eye on going forward, though it has to be noted that the Saints certainly wouldn't give a player a 4 year deal worth $24 million if they thought he wasn't actually capable of performing the job. And with their O-Line being rated as one of the very best in Pro Football last season under Offensive Line coach Dan Roushar , you'd have to think that they'll be just fine. Given that New Orleans already has a handful of other experienced O-Linemen on their current roster, it seems more than likely that Easton should be able to adapt and ultimately "fit right in". Also keep in mind: the Saints still have soon-to-be 3rd year veteran Cameron Tom on their roster; and prior to Easton's signing last night, it was believed that the former University of Southern Mississippi star and Baton Rouge native was the player originally expected to succeed Unger at the position to begin with. The Saints coaching staff has been very high on Tom since the team signed him as an undrafted free agent following the 2017 NFL Draft; and they have been "grooming" the extremely versatile former Baton Rouge Catholic High School All-State O-Lineman to take over at center ever since he arrived two years ago, and I'd personally be shocked if Tom doesn't actually win the job outright. It's the reason why you shouldn't be surprised one bit later on this coming Summer if Tom, Easton, and last year's 7th Round rookie draft pick Will Clapp from LSU, all end up competing for the starting center job during Training Camp in August. Long story short: Easton was signed as "insurance" in case Cameron Tom ISN'T ready to take over yet. And while the likely expectation at first will be that Easton should become the new starter (because why would you give him a 4 year, $24 million deal otherwise), that's essentially why the signing was made: to ensure the team has adequate depth and experience at the center position. In any event, the Saints have been very proactive and aggressive so far in pursuing free agents that can help them address their lingering team issues that needed to be addressed before the start of the 2019 NFL Season later this year; and last night's signing was more evidence to that fact.